Click Import button to choose ".csv file" option and select the local ".csv file", and then open it to enter the Information Window. 1. In the Information Window, users need to match the Contacts info between the imported ".csv file" and device. 2. The imported ".csv file" items is the leftmost "csv" list, and your device items is the rightmost "device" list. The checked options are the matched items between imported ".csv file" and device. 3. 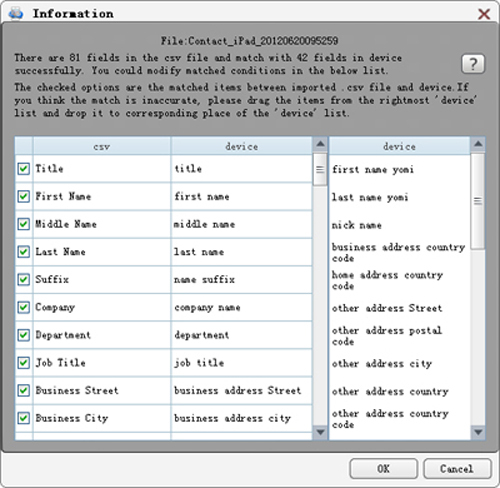 If the option is not checked, users need to match the item by dragging the correct item from the rightmost "device" list to the corresponding place of middle "device" list. 4. If you think the matched item is inaccurate, you can drag the items from the rightmost "device" list and drop it to the corresponding place of middle "device" list. 5. When you think your needed information are matched accurately, please click OK button to complete the CSV file importing. Instead of viewing text messages online, learn method to save the text messages. You might retrieve deleted files, find the way to get back messages of Whatsapp.